I always wonder what to put in my hand luggage bag when flying, especially when flying long haul! But I don't often travel short-haul, and was thinking of things I would need for my three hour flight to Iceland. Here is what I pack in my hand luggage for a short haul flight! A Book - This is a MUST for me wherever I go! I always carry a book with me anyway, so this is a definite for a short haul flight! On my flight I'll be reading Harry Potter And The Philosopher's Stone. It's one of my favourite books ever! A short haul flight is a great time to catch up on some reading, and with me going to Iceland, I don't think there is a more magical place to read Harry Potter! Moisturiser - The air, when you're flying, makes your skin quite dry; which is why you are often reminded in flights to drink a lot of water! 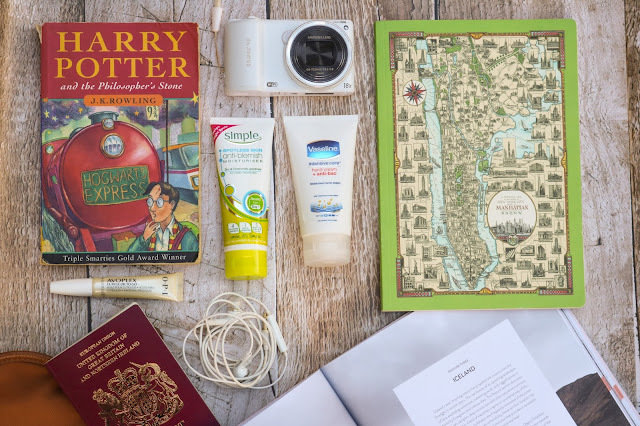 I always have a moisturiser handy, just in case my skin starts feeling a bit dry, and it also serves as a cool pick-me-up just before you land, making you feel fresh faced to face the beginning of your adventure! Cuticle Oil - Like I said before, the air when travelling by plane, can make your skin feel very dry, so as well as moisturusing, I also like to keep my nils and cuticles in check by caring the handbag sized Avoplex Oil by OPI. It's a great little item and helps keep my nails looking healthy and well manicured! Hand Cream - You can see where I'm going with this... The hand cream I'm taking with me not only moisturises, but it also is an anti-bacterial as well! BONUS! I'm going to be taking A LOT of moisturisers to Iceland with me, the last thing I would like is dry skin in the cold! Earphones - Most flights offer in-flight entertainment, and some flights make you pay for a headphone set, so that's why I bring my own! If your earphones aren't compatible, at least you have your earphones to listen to music on you phone! A Notebook - Much like a book, I always carry a notebook with me anyway. I always find them super handy, especially when I need to jot down any idea's or inspirations I've just had! I've got many, many notebooks filled with random ideas and doodles! A Camera - For this trip, I'm taking both my Canon 750D and my little Samsung vlogging camera! I'm taking these in my hand-luggage case just for knowing that they will be safe! I wouldn't like my camera's to be damaged in my main luggage case, so for peace of mind I'm taking them in my hand luggage case; and plus, you never know when you'' take a great picture or capture a great bit of footage! So, that's what I'm going to be packing in my hand luggage for my short flight to Iceland! Let me know what you pack, any essentials that you pack that I should know of?